Post 2/2: If you are looking for my final My Time Made Easy project, please scroll down! Welcome to the first day of sneak peeks of the September Sparkle Creations Rubber Stamps release! Sparkle is releasing 3 new images at midnight EST this Saturday, September 11.. Today the team is showing Fall Charlotte! This is my attempt at a Clean and Simple (CAS) card. DH always tells me that I put too much on my cards... I guess I won't be asking his opinion anymore.. LOL, just kidding! While I do love layers, sometimes I think less is more. I colored this sweet image of Charlotte with Copics and Prismacolor pencils. I love using these 2 coloring mediums together, but I always get a headache when I use odorless mineral spirits (to blend my colored pencils). This time I used Goo Gone. I don't think it blends as well as OMS, but at least I didn't feel ill after coloring my image! Please welcome our fabulously talented guest designer this month... Risa West!! Be sure to visit her and the rest of the SCRS designers for more peeks of Fall Charlotte. Sparkle will be giving away a Fall Charlotte to one lucky person! For a chance to win, you need to comment on all of the designer's blogs (list below). Then head on over to the SCRS blog and comment on the Charlotte post. You have until midnight EST each day to comment. The lucky winner will be announced the following day! I'll be back tomorrow with another peek! Thanks so much for stopping by! Accessories: Classic Circle Nestabilities (Spellbinders), Woodland Branch border punch (Martha Stewart), Markers (Copic), Prismacolor pencils and Goo Gone, Silver nailheads, Foam tape, Thread, Sewing machine. This is adorable. Love this cute image and lovely punch. Such a lovely card! I love that border! Don't listen to him, Stephanie - all of your cards are perfect! Love this one - brilliant border and stitching! Adorable image. You can never put too much on a card. :) (Of course I have been known to add a few things too!) Beautiful card. Absolutely beautiful - I love how the image is the main focus. A lovely CAS example with this delightful stmap. Love all the white allowing the stamp/image to just feature . That border is a wonder & so apt with the image. I love the clean lines of your card! Charlotte is cute as can be and your detailing is fabulous! This is so pretty. I love how you've colored Charlotte. This card is so elegant, Stephanie! I love the border you created! And your coloring is so beautiful!!! Beautiful job of coloring. I have such trouble with colored images that I truly am in awe of those that can bring an image to life using copics or markers. Fabulous! Elegant card backdrop for this fun new Charlotte! This is a great CAS card! I love the border punch towards the bottom and the stitching on the dp panel. Wow Stephanie! This is clean, simple, and beautiful! Sometimes less is more, but we all love our embellies! Beautiful colors and coloring, Stephanie! 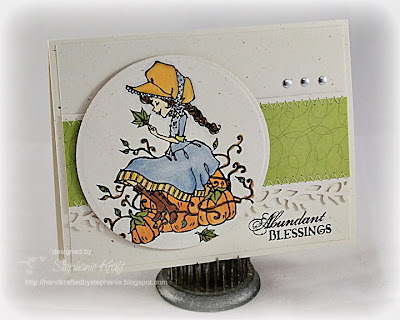 Love that punched border as well, a subtle detail that adds such richness to your card! Great job! Great CAS card! Lovely coloring and love that border punch! I think your card looks fabulous! what a great idea for blending colored pencils! I have a whole big bottle of goo gone! What a sweet, adorable image this is!!! Beautiful work Stephanie! She is SO super sweet Steph! LOVe her! love all the white - it really makes your coloring of the image pop. gorgeous card! this is absolutely adorable stephanie! Love this image!! !